The holidays are fast approaching and I am setting an intention to truly appreciate and enjoy every day with my family. I know, it’s kind of a tall order but a moment of grace at the girl’s bedtime the other night led me to a realization. As they were getting ready at a record-breaking slow speed, I found myself in an all too familiar state of extreme irritation waiting for teeth to be brushed, pj’s to be put on, stories to be read and snuggle time to be over so I could move on to whatever I felt was so important at the time. I know those of you who have ever had small children to get settled for bed can relate because I’ve commiserated with many of you about it. As I struggled to calm myself down, I took a few deep breaths and then it hit me. This is it. My girls are almost 7 years old and although I’m looking forward to watching them grow into young ladies, they will never be this little again. The times we are sharing right now are what I dreamed about for years before they were born and will undoubtedly turn into some of my fondest memories. You could say it was my own “Cats in the Cradle” moment, albeit far less dramatic. So, I shifted my focus and truly enjoyed listening to Ella read the entire “A Fly Went By” book. Really, I did. And, since then, I’ve been able to keep that shift in focus for the most part. Sometimes all it takes is changing your mind. Where does pot roast fit into this? It doesn’t really, but it does allow you to prepare it ahead of time then relax and enjoy your family or your company. This is a recipe I found years ago and I think it’s perfect so I haven’t messed with it like I normally do with other people’s recipes. 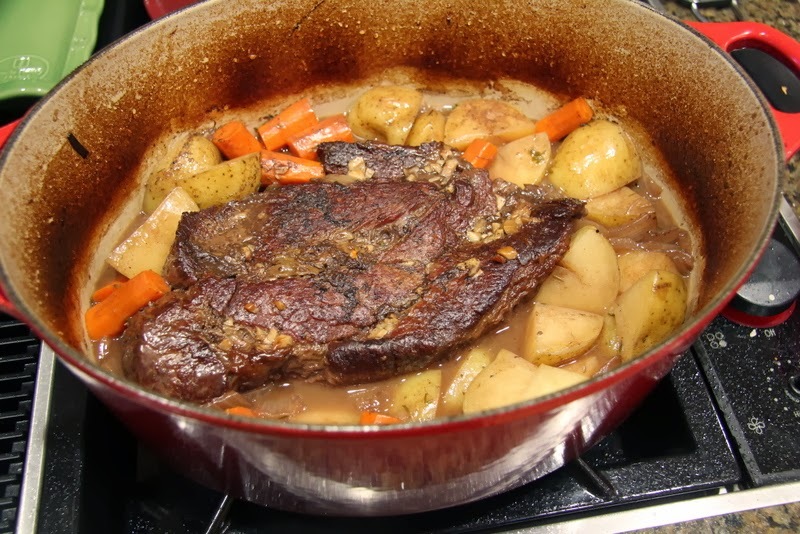 Pot roast resides permanently in the ultimate comfort food category so, if you haven’t made it before, it’s probably time you learned. 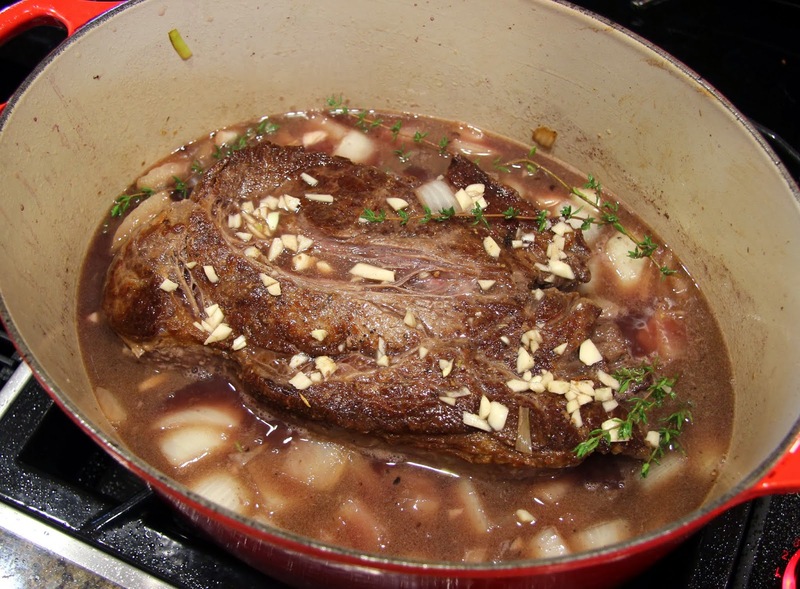 It’s simple but requires a few crucial steps like caramelizing the meat (fancy for browning) so read on and you’ll have perfect pot roast for your next family meal. Serve it with a green salad and homemade ranch dressing for a complete meal. 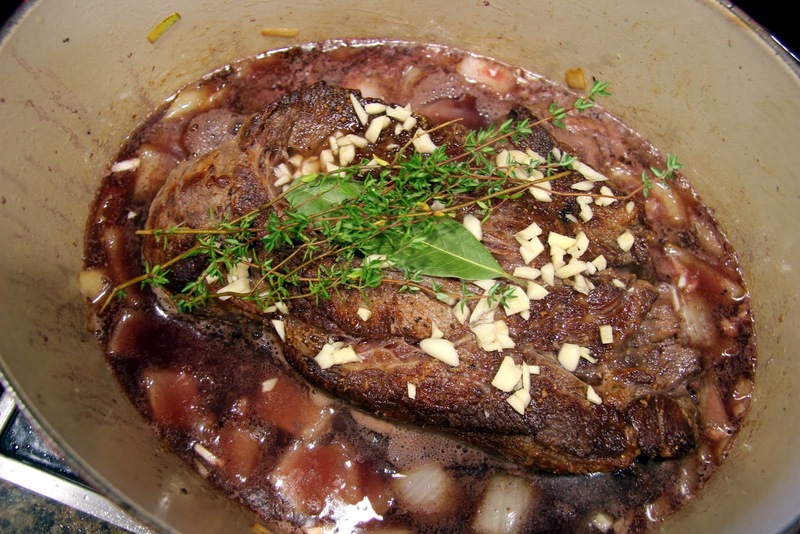 Take the chill off the roast by allowing it to rest at room temperature for about an hour. 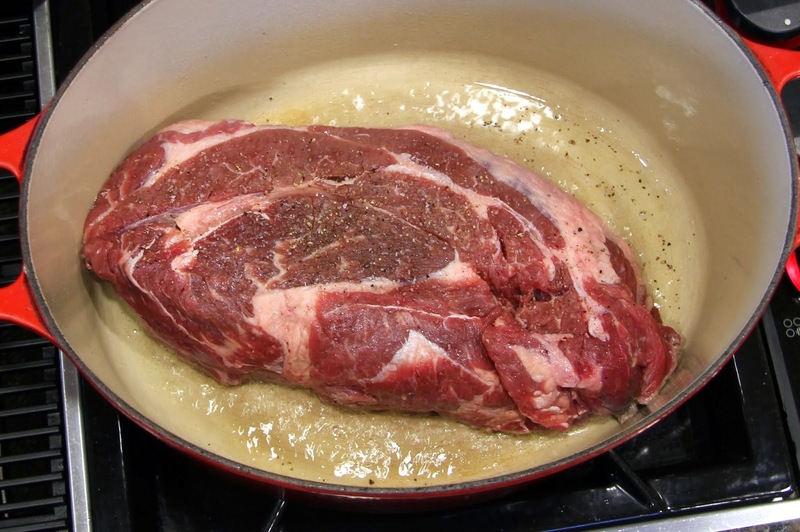 Before browning, thoroughly dry the roast with paper towels to remove as much moisture as you can. 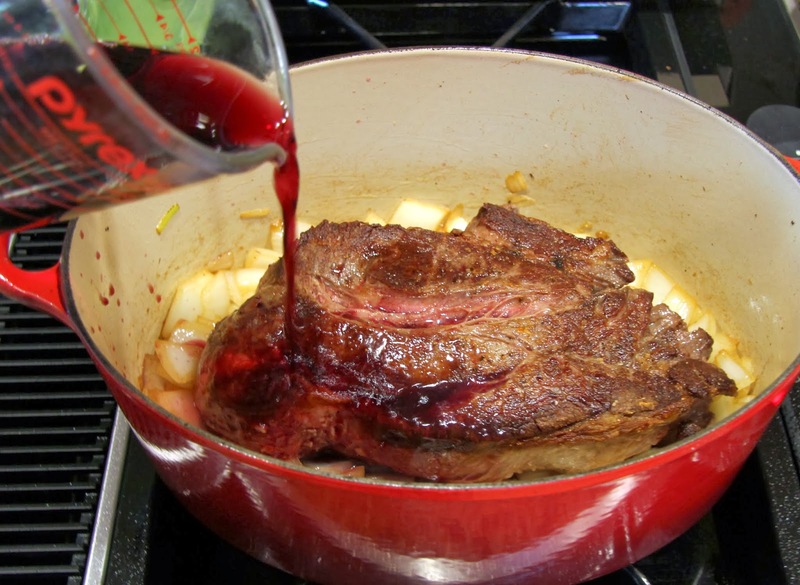 This will allow a good sear and prevent it from steaming. 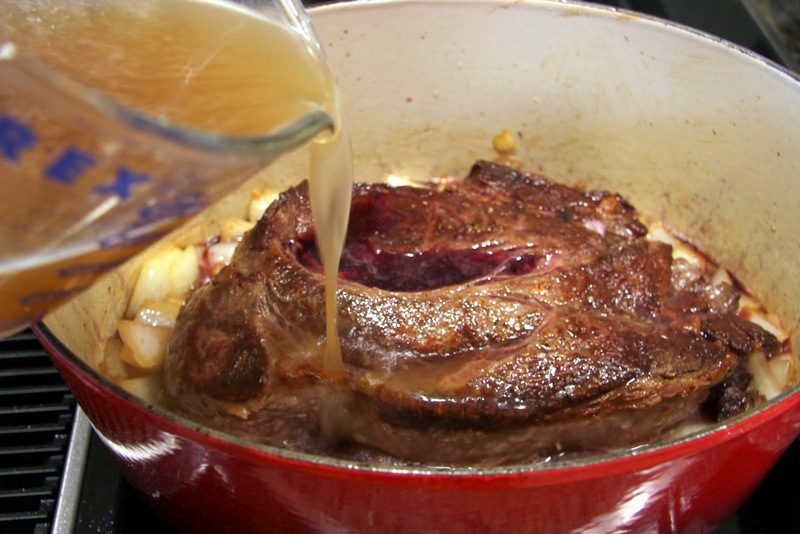 The caramelization of the meat is crucial to building the flavor of the pot roast. lay the roast in the pan. I use tongs and oven mitts so the sizzle doesn’t burn my hands… yes, I learned the hard way. 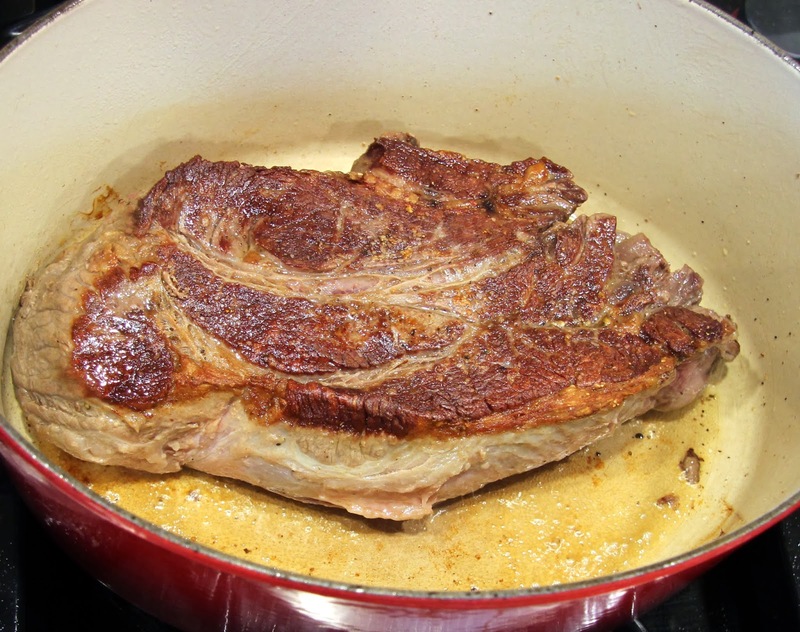 Allow it to cook about 5 minutes per side until you get a beautiful brown sear. 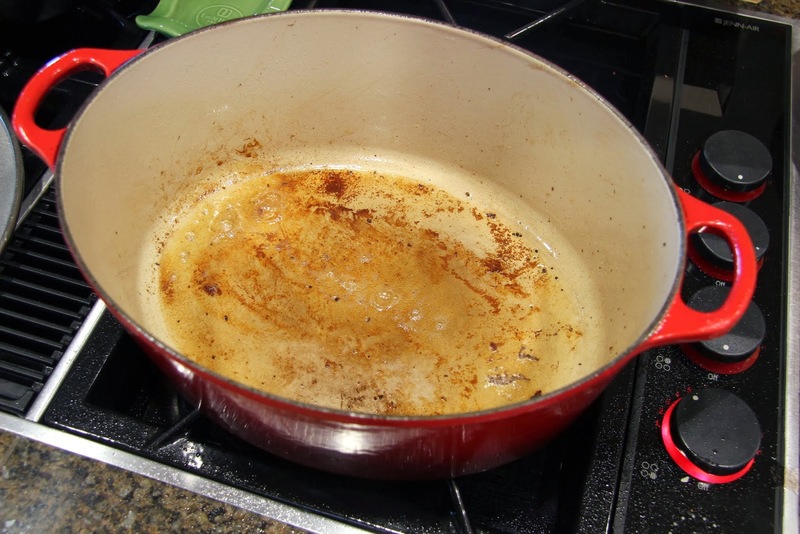 Meat should always release from the pan easily when it’s done browning, if it’s sticking, leave it alone because it’s probably not finished browning/caramelizing. Tongs work best for handling the roast. 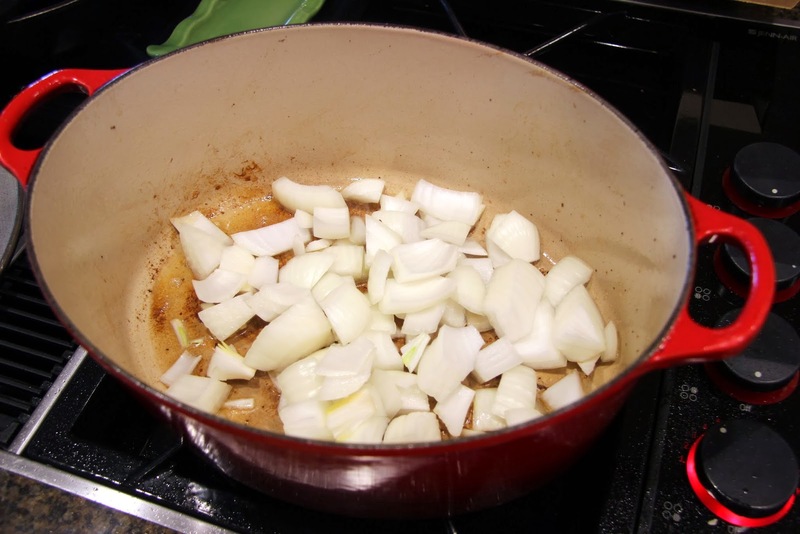 Chop your onion and garlic while the roast is browning. 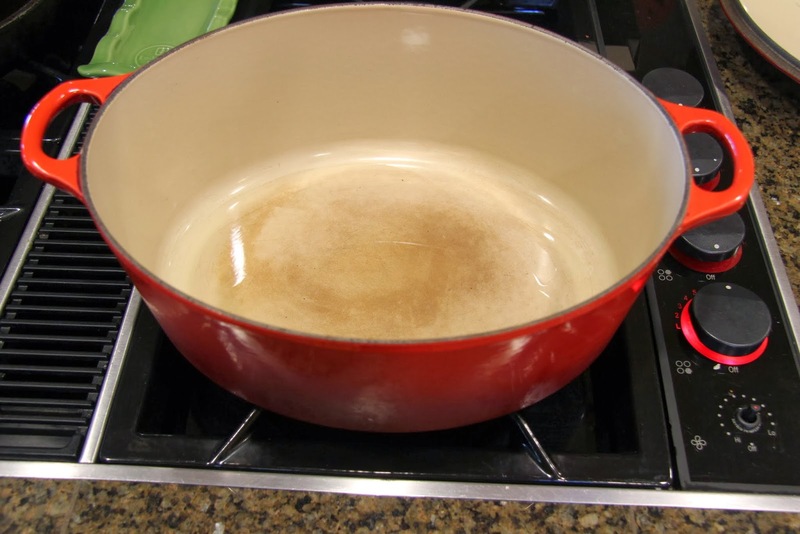 Once browned on all sides, transfer to a large plate or platter and set aside. You will have lovely little brown bits left in the pan. 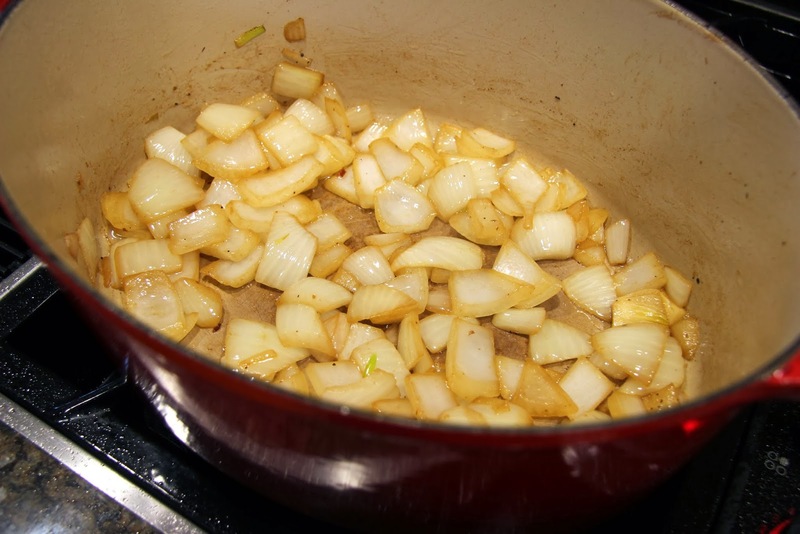 Add the onions and saute until tender, 8 – 10 minutes. thyme sprigs, garlic and bay leaf. Stir ingredients around a little so they commingle nicely. Cover and bake in preheated 350-degree oven for 1 1/2 hours. Meanwhile, chop your carrots and potatoes. 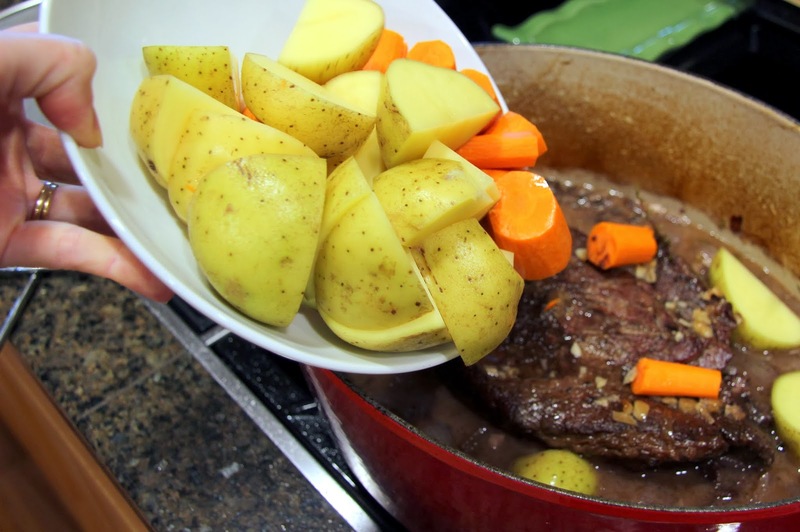 Remove roast from oven, add carrots and potatoes, and cook an additional hour, until veggies and roast are tender. Allow it to rest for 15 minutes before serving. Now this is something I need to warm the inner parts of my guts. I've got the ingredients to hand but I don't know what 'chuck roast' is. 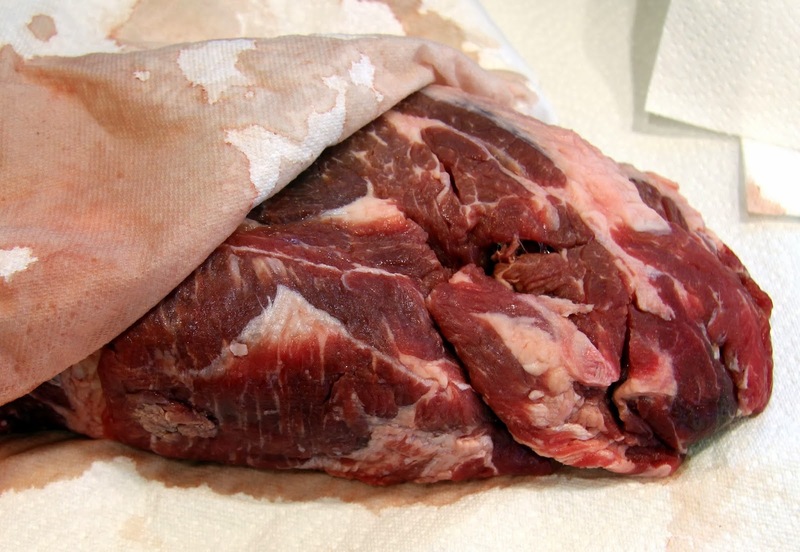 Is there another name for this part of the beef please? I love the way you do all of this step by step with photos. It really helped me to enjoy making the dishes since I'm usually not someone who enjoys the cooking process. But I love to end the end result. 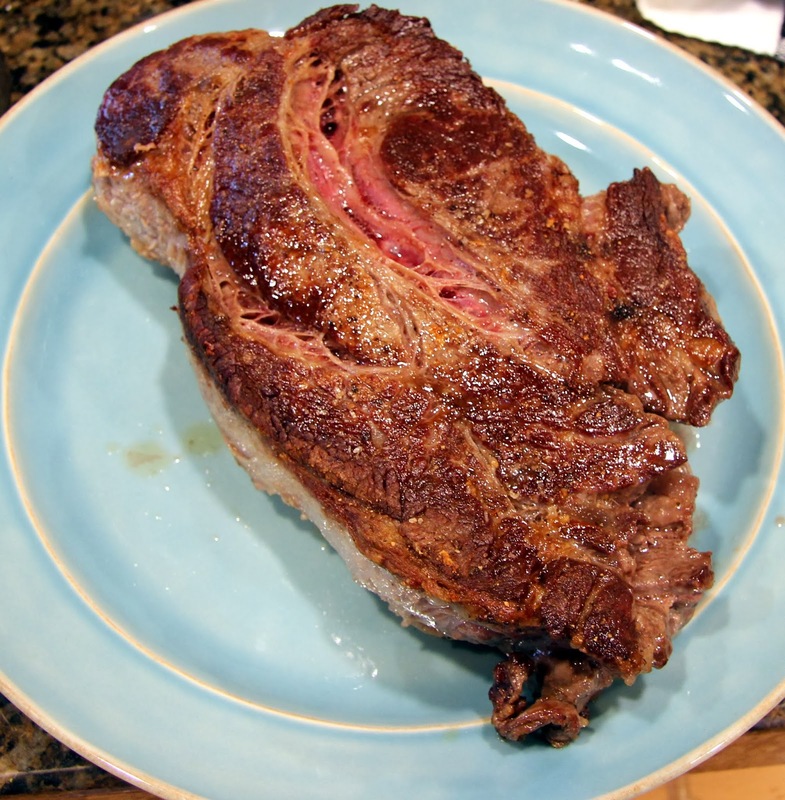 A couple other names for chuck roast are 7 bone roast and braising steak – I hope that helps. I'm so happy the step by step photos are helpful to you! !